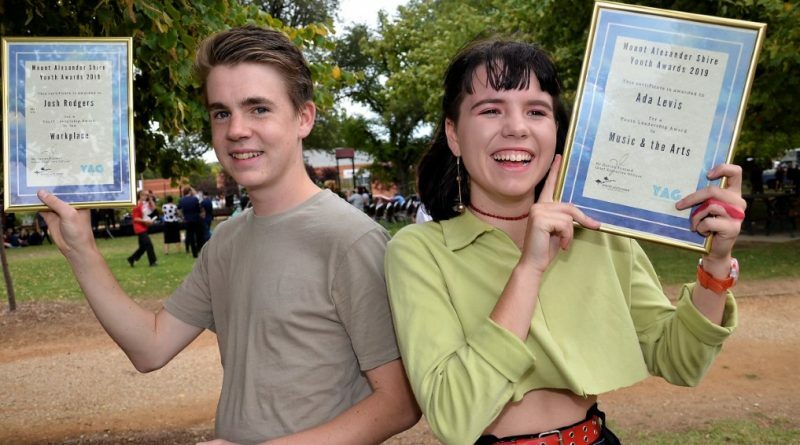 Ada Levis and Josh Rodgers were among the young people to be celebrated at Friday's festival. 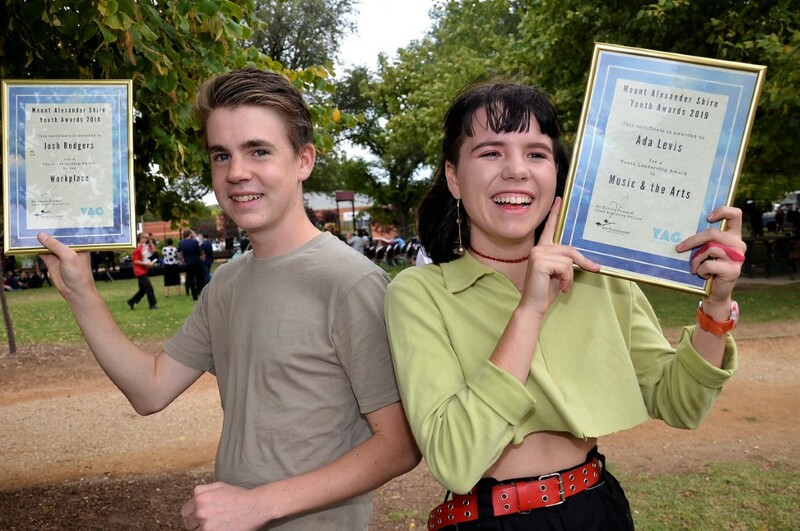 Victorian Youth Week and the school holidays kicked off in style on Friday with a Youth Festival in Castlemaine’s Victory Park celebrating the achievements of young people in our community. The Mount Alexander Shire Youth Festival saw community members enjoy a range of fun activities including tie-dying, a Young Makers Market, live entertainment from young musicians Isabella Fortuna, Maya Rose and Ethical Decimal, and the announcement council’s 2019 Mount Alexander Youth Awards. The awards recognise leadership across six separate categories. Award recipients were Cohen Saunders – Youth Leadership Award in the Community; Josh Rodgers – Youth Leadership Award in the Workplace; Ada Levis – Youth Leadership Award in Music and the Arts; Harriet O’Shea Carre – Youth Leadership in the Environment; Amy Bachmann – Youth Leadership Award in Sports and Recreation; and Oscar Johnson – Youth Leadership Award in Education. Mount Alexander Shire Council CEO Darren Fuzzard said the shire’s youth award winners were an incredibly impressive group of young people. “It’s fantastic to see their impact on the community and celebrate their achievements,” he said. Cohen Saunders won the community award through his significant volunteering roles both within his school and the community. “Once a week for the last 18 months Cohen has volunteered with local farmers – Gung Hoe Growers,” Mr Fuzzard said. As the winner of the workplace award Newstead teen Josh Rodgers is also impressing many with his innovative approach to business. “Josh built his own solar-powered coffee roastery, and has established his own coffee roasting business,” Mr Fuzzard said. “The winner of the music and arts award Ada Levis, somehow manages to find time to attend school, host two weekly radio shows, perform in the popular local band Stop That Mammoth, volunteer on a number of committees and study radio broadcasting! “Harriet O’Shea Carre is our environment award winner for her integral role in the Students Strike for Climate Change campaign. She has encouraged thousands of young people to get involved and stand up for action on climate change. “Amy Bachmann is the winner of the sports and recreation award for her achievement in the equestrian field of dressage. As a member of the Victorian inter-school team for five years, Amy is now one of the team’s leaders and mentors younger riders with training and support. The youth festival was organised by members of council’s Youth Advisory Group and FReeZA committee (Eight Metre Speaker), Young Makers Market Committee and help from council. The event was supported by a state government Youth Week grant. “Thank you to everyone involved in the festival, particularly the judges, the presenters and all the volunteers who worked tireless on such a positive and energetic event,” Mr Fuzzard said. 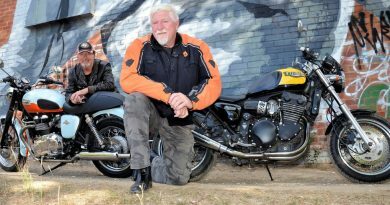 Castlemaine's Cr Dave Petrusma is among local bikers who have the upcoming Anzac weekend rally locked into their diaries. 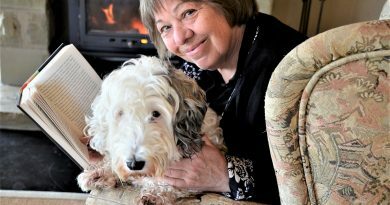 Bendigo Writers Festival director Rosemary Sorensen - pictured here with Sealy the sealyham terrier - is among the many looking forward to the popular upcoming event. 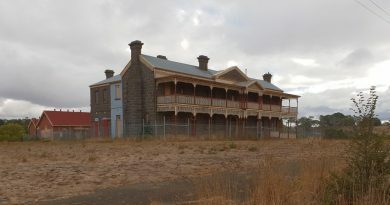 Winport Developments has abandoned its plans to develop the Old Kyneton Hospital site and has instead put it up for sale.